JOHANNESBURG (miningweekly.com) – Empowered Sibambene Coal on Tuesday announced its intention to acquire high-quality existing and greenfield coal assets in South Africa to promote inclusive growth and competition within the coal sector. Energy group Mercuria, mining investment company Menar and 100%-black-owned investment company Kalyana Resources are the three main shareholders in Sibambene, with a combined 75%. The remaining Sibambene shareholders are black-owned industrialist group Mirospan, with a 10% interest; the Inkhanyeti Women’s Group, with a 5% interest; and the Siyakha Communtiy Trust and Khulisa Employee Trust, which hold 5% each. Sibambene chairperson Dr Nomfundo Ngwenya stated that the 51% black-empowered company's name is a Nguni word meaning ‘We are united’. She said that the name and the logo, are a “direct reference to what we’re trying to do and achieve in the context of the Mining Charter. . . and of what the mining industry ought to represent [with regard to] maxisming the natural endowment of South Africa and the socioeconomic benefits that can accrue from that”. Ngwenya added that the company sought to inspire new entrants in the mining sector and change the narrative around who participates in the sector, as well as who benefits, stressing that Sibambene and its partners have not participated in any major empowerment transaction in South Africa and that it seeks to broaden empowerment beyond established empowerment players. Additionally, she pointed out that Sibambene, through its shareholders, have the technical and financial backing to invest in quality assets and maintain sustainable operations, thereby supporting job and wealth creation. Menar founder and Sibambene director Vuslat Bayoglu noted that there was a lack of competition within the sector, noting that an oligopoly controls the coal resources, Richards Bay Coal Terminal (RBCT) allocation and coal supply to Eskom. He noted that, as at December 2017, Exxaro, South32 and Glencore owned 87% of South Africa’s coal resources, and that those three companies, along with Anglo American, controlled 75% of the RBCT allocation. Additionally, Exxaro, South32, Glencore and Seriti Resources supplied 68% of Eskom’s coal. This point was reiterated by Sibambene director and Marospan chairperson Dr Sakhile Ngcobo, who commented that, despite the narrative around coal and clean energy, 1 600 new coal-fired power plants are planned or currently under construction in 62 countries. He added that once completed, the new plants would expand the world’s coal-fired generation capacity by 43%. Ngcobo commented that the globally installed renewable energy capacity averages about 20% and that coal would likely remain a dominant electricity supply source for at least another 50 years. Ngwenya said the company was officially established and registered towards the end of last year and is actively looking to acquire assets that have good geology and are easily accessible. Production and employment figures would be determined by the types of assets Sibambene acquires. Bayoglu noted that Sibambene does not intend to list in the immediate future, as coal mining companies are undervalued on stock exchanges because of the perception around coal. However, he noted that the market might change and did not rule out a possible future listing. 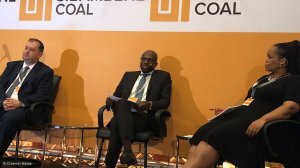 He further noted that, while financial institutions might shy away from investing in coal-fired power stations, that did not necessarily mean that they would not invest in coal mining projects. However, he added that Sibambene had the advantage of leveraging Mercuria’s balance sheet, if external financing solutions do not arise. Ngwenya stated that coal was a strategic resource for South Africa and that companies should not be adverse to maximising the potential of the resource, leveraging it to improve the lives of South Africans and secure the country’s energy supply. “We have seen what failure to secure supply can translate to,” she noted, adding that the “spoils” of natural resources should be spread to the broader society and that Sibambene was looking forward to further engagements with the media and stakeholders once it acquired its first asset. Meanwhile, Bayoglu stated that Eskom should have a price index for its coal procurement. He noted that Eskom faced two significant issues, namely its inordinate debt, which arose from its inability to efficiently complete Medupi and Kusile, as well as its coal procurement and the lack of transparency around the prices it is paying for coal. Bayoglu noted that the government had been hamstrung by Eskom’s inability to ensure supply, which greatly harmed the government’s ability to attract foreign investment. He implied that, at the core of this instability, was the utility's exceeding of its budget and timeframe for the power stations’ completion. He added that more than 85% of Eskom’s costs are related to coal procurement and, given that the utility uses public money to source its coal, it should be more transparent about the prices it pays coal producers. Bayoglu stressed that labelling this request for transparency “anticompetitive” was baseless, as the RBCT published its export prices. He added that if Eskom is not willing to be more transparent about its coal procurement, “there’s a problem”. Bayoglu concluded by noting that Eskom should share information around what it is currently paying for coal and what it would like to pay for coal, so that the market can respond accordingly, as the functioning and future wealth of the country is dependent on a secure electricity supply.